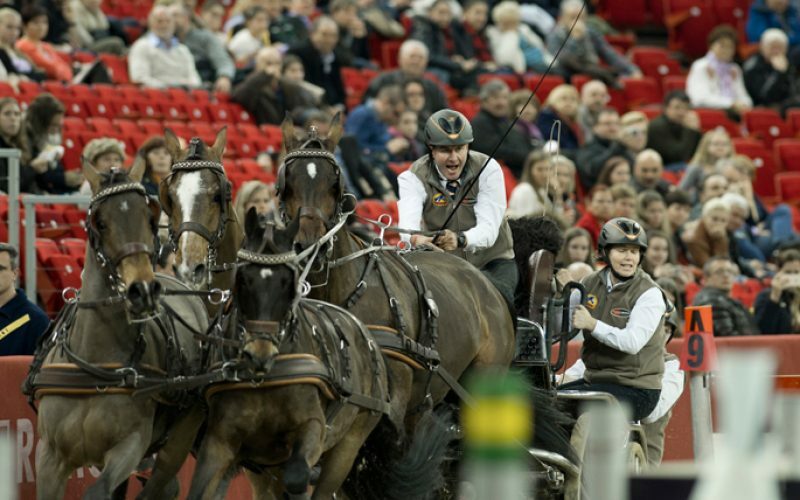 Dutch four-in-hand driver Koos de Ronde experienced a superb start of his FEI World Cup™ Driving season in Budapest. 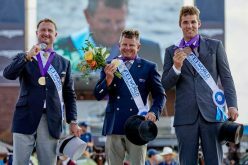 The bronze medallist of the World Championships in Breda set the fastest times in the third leg of this season’s series and won the competition with seven seconds advantage to home driver József Dobrovitz and Belgium’s Edouard Simonet. 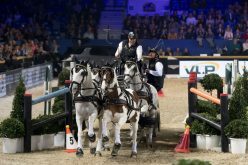 After one year of absence, the FEI World Cup™ Driving leg in Budapest joined the series again, much to the joy of the Hungarian driving fans, who attended the exciting competition in the Lászlo Papp arena. 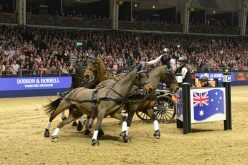 This year, the programme existed of a show of the famous Spanish Riding School in Vienna, followed by the FEI World Cup™ Driving class. 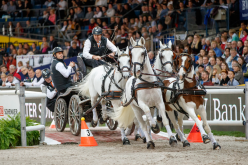 The spectators were treated to a great competition where the six drivers battled it out in the course, laid out by Hungarian top course designer Gábor Fintha. 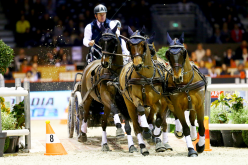 Koos de Ronde had an advantage of six seconds going into the second round, which took place over the same course. 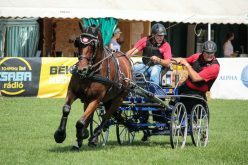 Despite the heavy footing, his experienced team of mixed bay horses went even faster and was eight seconds faster than József Dobrovitz in the end: “This is the best thing about the sport, Dobrovitz drove a very good round and I had to try to top this. 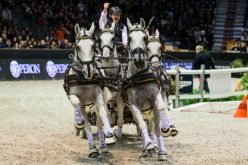 I knew that if I had one knock down, I could lose my advantage, so I really went for it!” De Ronde’s plan is to pick up World Cup points as well in London Olympia and try some new wheeler horses in Mechelen (BEL) where he will compete with a wild card. József Dobrovitz jr. drove clear, but was just a few seconds too slow to qualify for the second round. He finished in fourth place, followed by Rainer Duen (GER), who had one knock down. Wild card driver Miklos Juhász finished in sixth place.